That didn't take long. 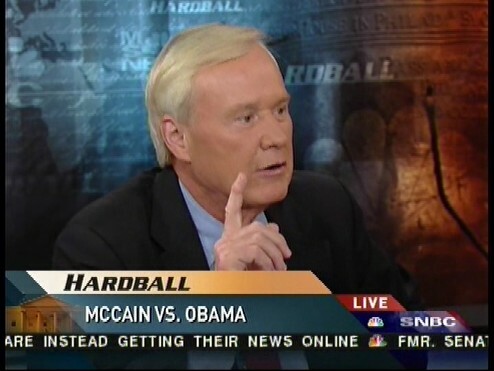 Tanned and rested on his first day back from vacation, Chris Matthews suggested on this evening's Hardball that under the guise of the "inexperience" charge, John McCain is handing out "permission slips" to racists to vote against Obama. Matthews put his poisonous point to Chicago Tribune columnist Clarence Page. CHRIS MATTHEWS: Let me ask you this. Isn't he [McCain] handing out permission slips to vote against Barack? "Inexperience" is my favorite. Because you could have all kinds of problems with Barack Obama: ethnically, politically, culturally, class—I don't know what the adjective is for class, but "classily." And you can have every problem in the world with Mrs. Obama. But you could hide it all under, not hide it all, you could present it all under one word: "you know, I've got nothing against him. He's a bright young man with a quality education, interesting new ideas. But he's not quite ready yet." And that's a fair critique which covers all your reasons for opposing him. Let's cut through Matthews' miasma. No one needs a "permission slip" to oppose a candidate on political, cultural or class grounds. Matthews' allegation was unmistakable: McCain is intentionally broadcasting a subliminal appeal to racists. If ever a candidate has tried to avoid the race issue, it's John McCain. Matthews should put up, shut up, or better yet, apologize.